We’ve turned the page on summer in the High Country. There’s a slight chill in the air in the mornings, a few trees are beginning to tease with reds and orange, the school buses are running, and the trail is moving forward at Rocky Knob. This coming week marks the beginning of the end of the first trail. The machines will be moving earth starting Tuesday and work until the first loop is complete in October. Expert DH racer and Hawksnest Trail Builder Andrew Mueller has joined Moto Mike as Rocky Knob intern. 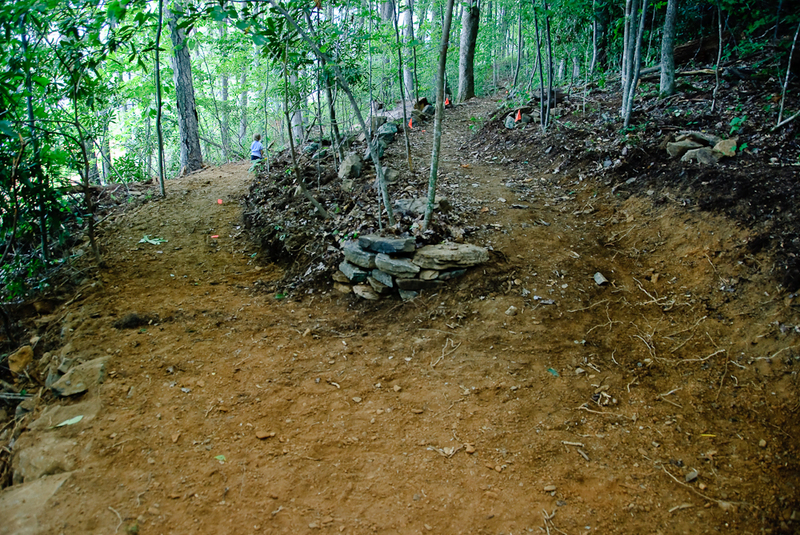 Mueller and Moto will combine their trail building and GIS skills to create awesome trail features and maps. ASU Appropriate Technology student and Alpine Towers employee Chris “CC” Curtin has begun a custom course of study this fall called “Sustainable Recreation Development.” CC will be planning, designing, and building bridges (with on-site locust) and a rain water catchment system for a bike wash station. A few local professionals have agreed to provide some skill development for volunteers. 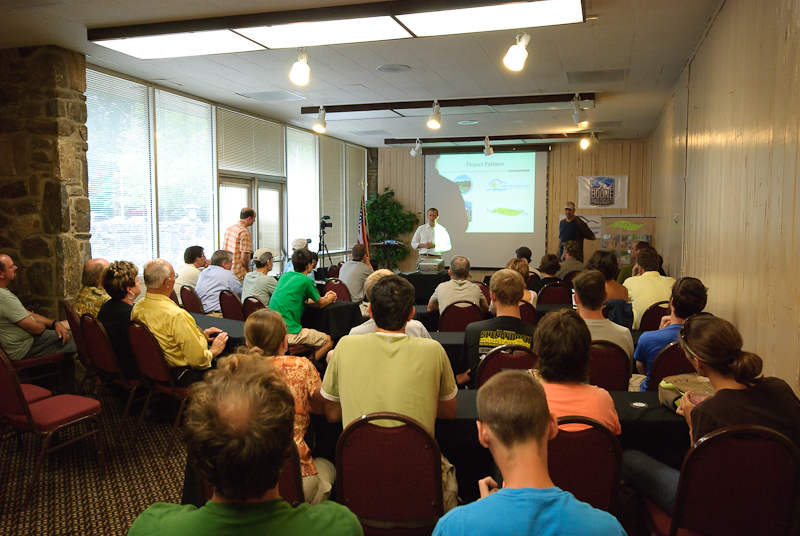 We will begin this training with a Stonework clinic in September (date TBA). We have logged hundreds of volunteer hours in the past few weeks and look forward to seeing you out on the trail this fall. Join us at 6:00 PM on Thursdays to get dirty. With the trail machines quiet for a couple of weeks, volunteers have been able to catch up with hand-finishing of nearly 2000 feet of trail. 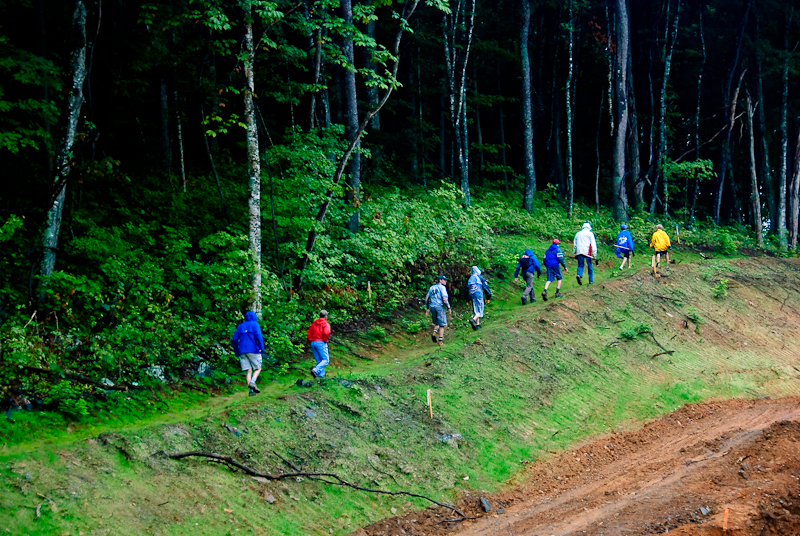 Thursday evenings at Rocky Knob are turning into the weekly work day as well as social gathering. 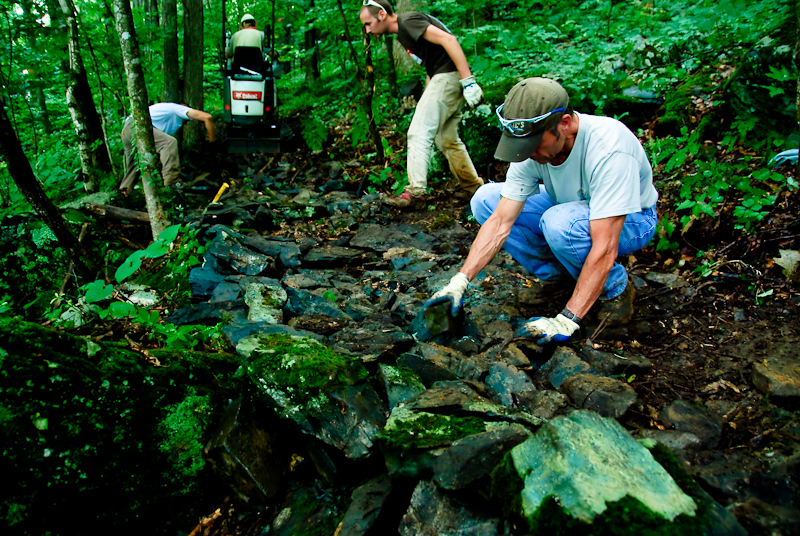 This past Thursday, twenty or so volunteers came out to clear corridor, finish the entrance trail, and build a stone crib walls. We meet at 6:00 PM each Thursday (unless there is lightening — we will work in a light rain) and work for a couple hours. Tools are provided. 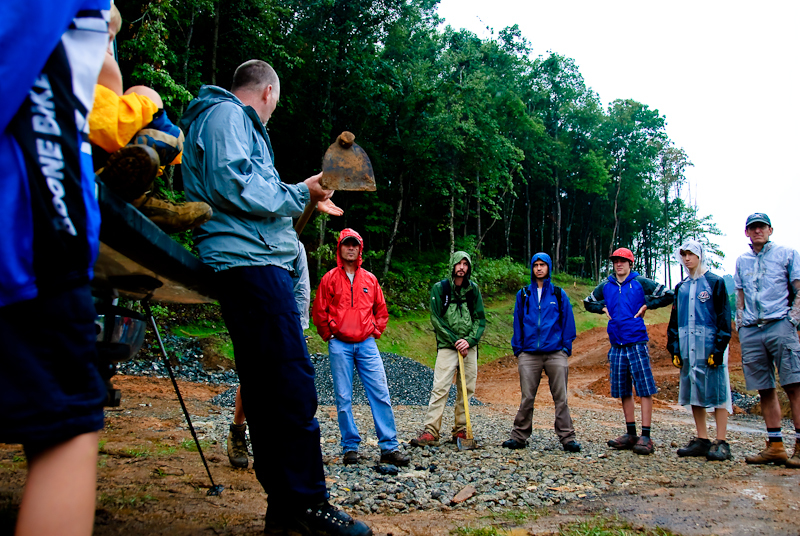 If you are a seasoned trail builder, come on out and lead a crew. New to getting dirty? We’ll get you started. Come on out to put your mark on what will be a great bike park. Levi Marland adds a mossy final touch to a crib wall. The view from the entrance trail. Dump truck drivers Jude and Silas get ready for their loads. 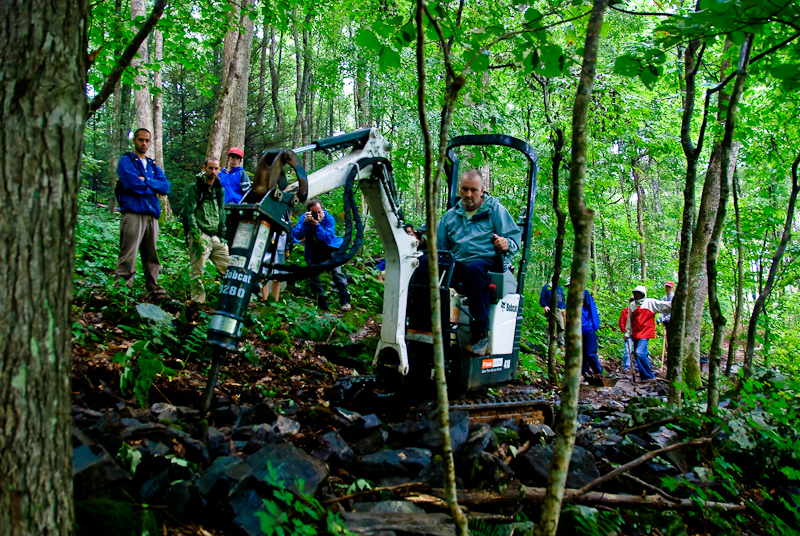 Do you have a group or class that would be interested in volunteer trail work at Rock Knob? We are beginning to schedule groups to come out for days in the fall. We can provide tools, a volunteer leader, and a cool project to meet your needs. Two hours of rock work? A whole day of various projects? Structure construction? We can arrange it. Send an email with dates you are interested in to: rockyknobtrails@gmail.com. 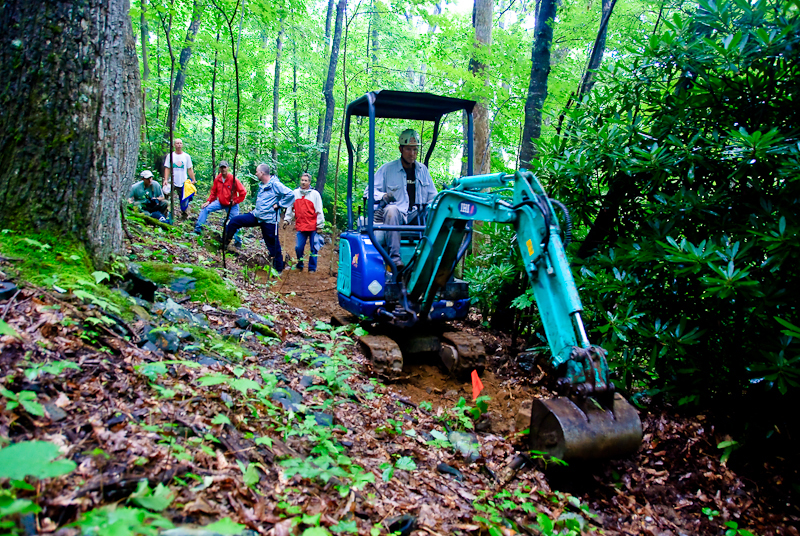 Volunteers have come out of the woodwork to nudge the trail at Rocky Knob along. Each day this past week individuals and small groups finished bench cutting and cleared more corridor. Our next official work time is this Thursday, Aug 12th at 6:00 PM. This week we will focus on corridor clearing again. Almost half of the 2.6 mile loop has been cleared but much more work is needed. Come on out and help! Part of the crew heading in to work. 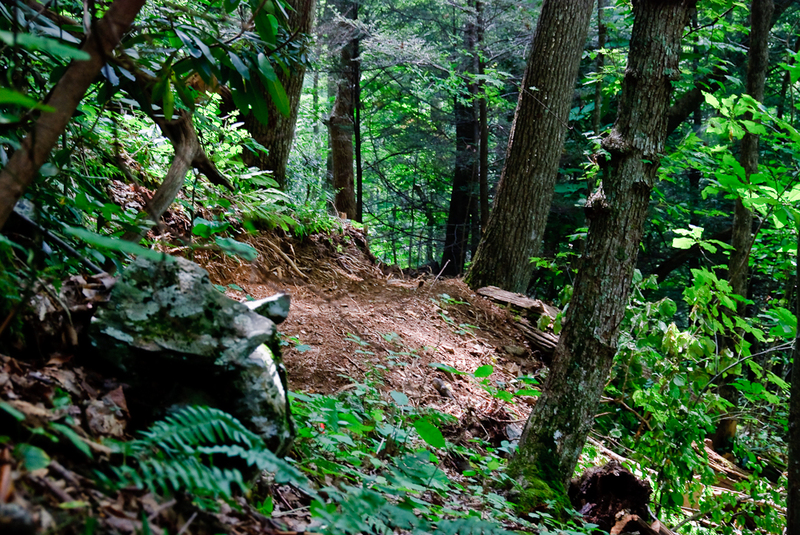 When Eric Woolridge began his job as Watauga County’s Outdoor Recreation Planner, there were no legal places to ride mountain bikes in the county. 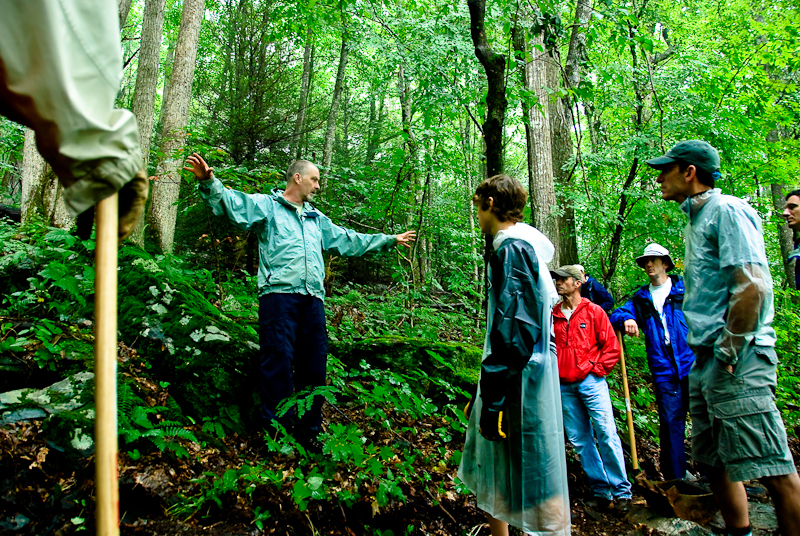 Not only has Eric worked to change this fact but over the past year he has created a vision that will propel Boone into the ranks of top outdoor recreation destinations in the country. Rocky Knob will be an important part of this vision. 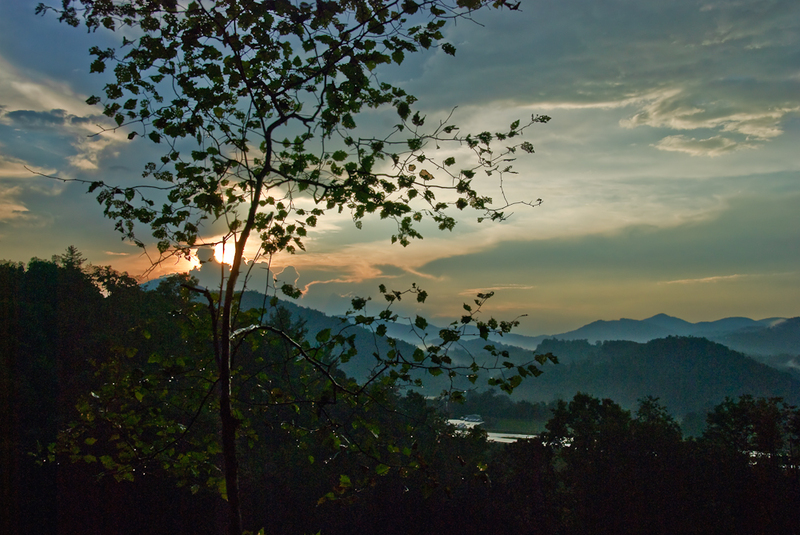 This past Thursday evening the vision for Rocky Knob became more clear. Woody Keen, CEO of Trail Dynamics (the company planning and building phase one of the trail system) presented his take on why Rocky Knob will be a destination mountain bike park: the proximity to town, the mature forest, the rocks, the opportunity for all levels of trail all rank high on the list. 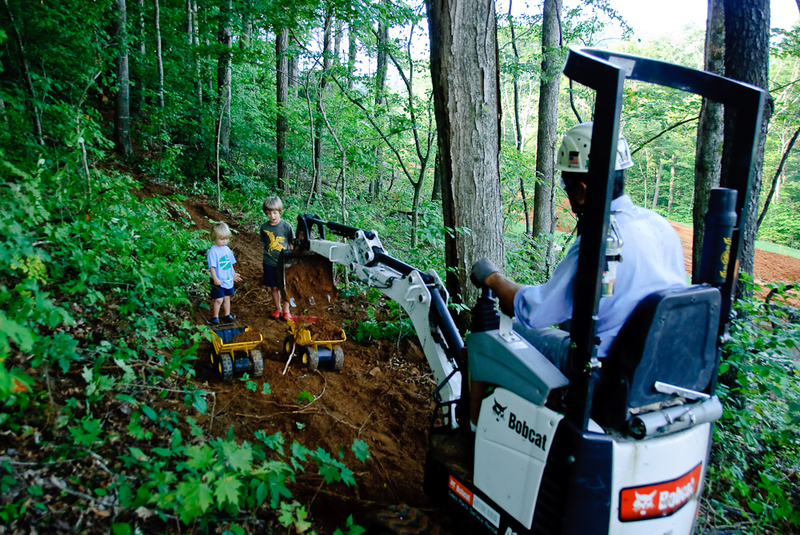 “This will be a park where families can ride great singletrack and rip cool rock lines together,” he says. 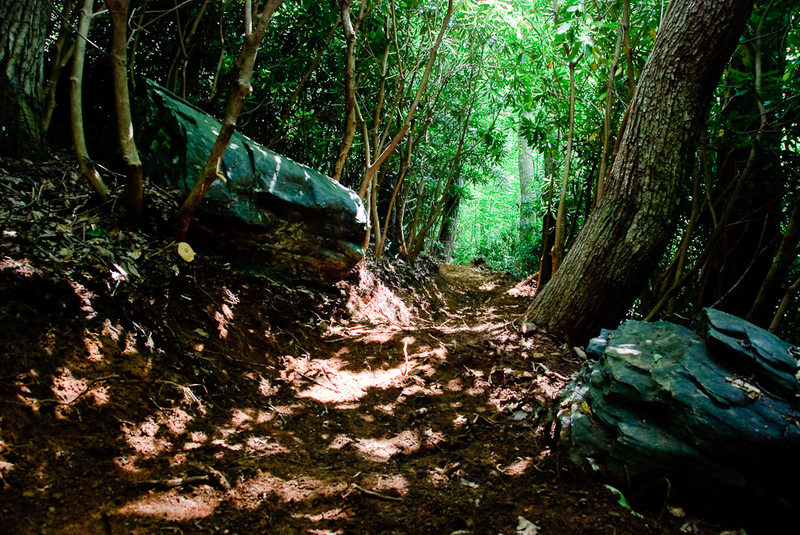 Woody has traveled far and wide riding and building trails and frequently compares Rocky Knob’s potential to the world-famous Coed-y-Brenin trail system in Wales. “One possibility we have here,” he adds in his comparison to the Welsh network, “is all-weather trails.” Much of the first loop will be hardened and will drain very well. Eric Woolridge concluded the evening with a poignant reminder: “We went to the county with this idea and they came back with the cash. Now it’s time to show them they made a good investment. Eric’s gauntlet is more of a work glove. 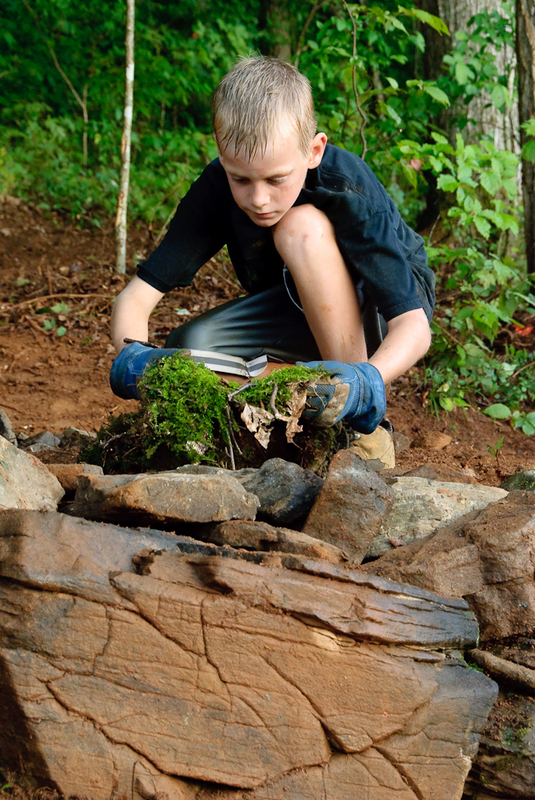 Breaking rocks is hard to do...unless you have a 500 pound rock hammer attachment on your mini-exc. Hand-finishing. The team works the back slope behind the machine. Bob in the second mini-exc. The machines work on opposite legs of the trail to maximize productivity. Stone Masons: building trail the Roman way. 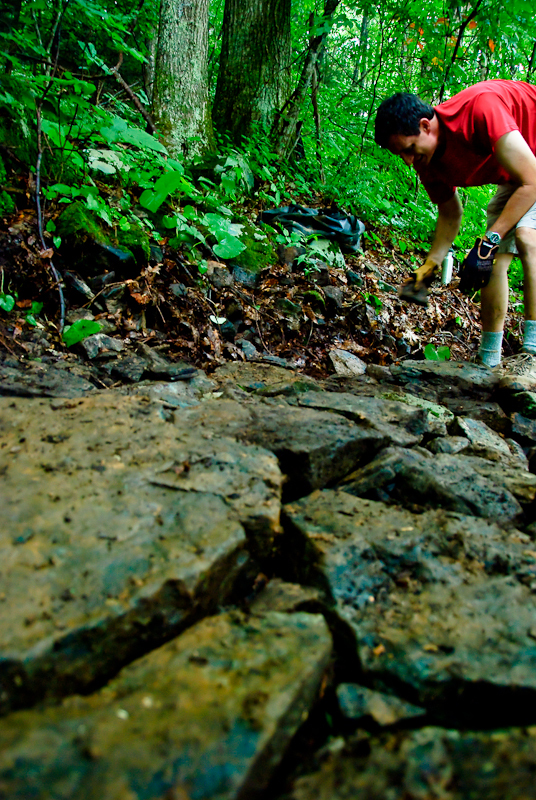 Much of the first trail through the boulderfield will look like this. 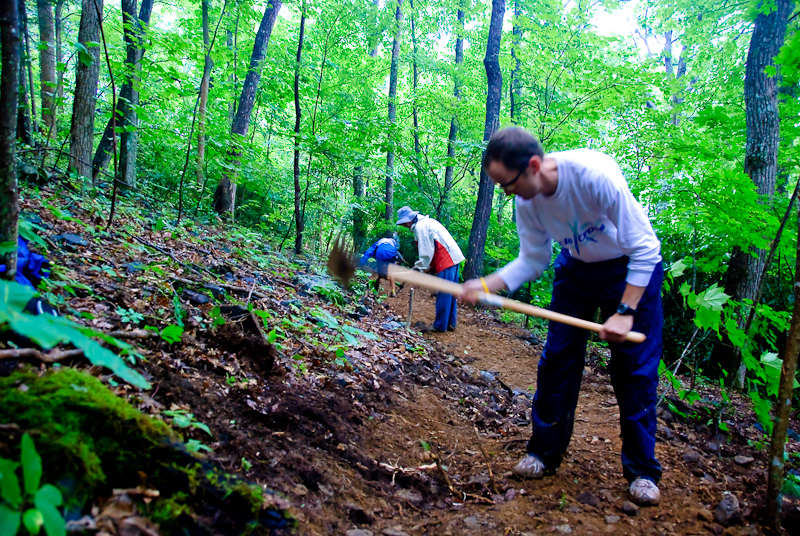 Join us for “Dirty Thursdays” to get involved in the park. We will be meeting each Thursday for the next several weeks at 6:00 PM at the Knob. Tools will be provided.